If you are comfortable with flashing factory images, proceed to our guide - you won't lose your data if you follow the directions. Otherwise, hopefully the OTA will be here shortly. 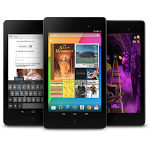 To get a better idea of what's new in Android 4.4.3, hit up this post.